They had me at "100X bet multiplier" but if you need another reason to try the new Leonardo's Loot slot game at Desert Nights Casino, how about "two special casino bonuses"!? 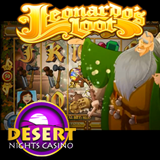 Desert Nights the new Leonardo’s Loot slot game from Rival Gaming and, until the end of this month, you can get TWO special bonuses to try it. Leonardo’s Loot is a 50 payline video slot game with some of Leonardo Da Vinci's whose famous inventions spinning on its five reels. Da Vinci himself can appear at any time. When he does he tosses gold coins worth 50x the triggering bet during normal play. During free spins those coins can give you a bet multiplier up to 100x. There's also a free spins symbol that awards up to 30 free spins where bets are tripled. If you get three or more free spins symbols while you're already in free spins, the Renaissance Free Spins Round with multipliers up to 10x, begins. Two get some free money to play with take advantage of two casino bonuses available until October 31st only. The first is a 100% match bonuse that includes $15 of free play. The second is a 150% deposit bonus. For details, see the Promotions section within the casino's cashier. You'll find over 120 unique online casino games from Rival Gaming at Desert Nights. If you're new there you can claim up to $10,000 in welcome bonuses.